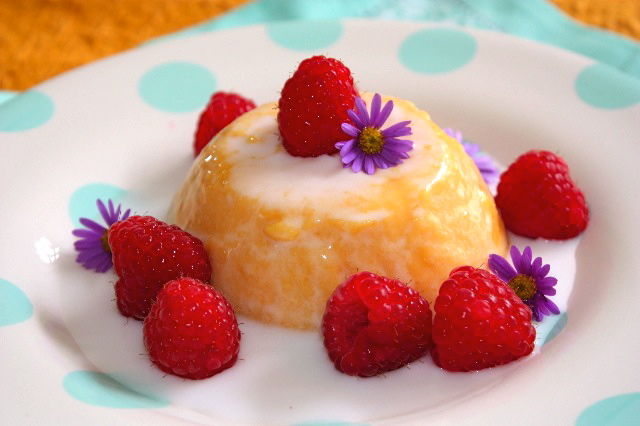 Here is a refreshing pudding for the summer, filled with fruits and exotic flavors. My lovely neighbor Rui gave me this mango pudding a couple of months ago and I fell in love with it. This is an Asian dessert, served in many Chinese or Indonesian restaurants. It’s usually topped with condensed milk. Of course, there are many recipes, some of them use condensed milk, some others coconut milk, some add mango pieces inside the pudding…so there are a lot of variations to this dessert. The last time I had one of those mango puddings was at a Chinese restaurant, and it was topped with condensed milk. What a delight! This pudding is creamy in the inside, so if you like it more gelatinous and hard, add more agar-agar (or gelatin). Instead of condensed milk I poured coconut milk that I sweetened with a tiny touch of sugar. So for those who like coconut, please try it, it’s such a wonderful combination. I ran into so many people who don’t like coconut lately, how is that possible? I thought coconut was like chocolate, one of those things that is universally loved. I was wrong. If you want to make this dessert vegan, instead of condensed milk, use coconut milk and agar agar instead of gelatin, it will work perfectly fine. I am due for my bi-yearly trip to France visiting my parents. I will try to post something before I leave on June 8, if not then I will post new recipes while I am there. I am so excited to get all the new summer fruits, and hopefully get lots of fruity recipes. Puree mangoes with a condensed blender and place in a large container. Mix condensed milk with agave nectar, and heat it up but do not boil. Dissolve gelatin powder in 4 tbs warm water. Add gelatin to the milk mixture. Mix well. Pour milk into the mango recipient. Mix well. If you want to add fresh mango pieces, add them at this stage. Divide the mango mixture to small glass containers. Place in the refrigerator overnight. 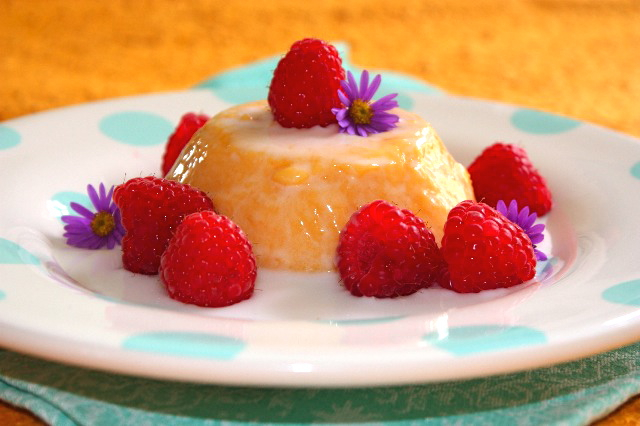 Un-mold pudding in plates, pour some sweetened coconut milk on top, and decorate with fresh raspberries. This entry was posted by silvia on June 3, 2011 at 1:10 am, and is filed under Desserts. Follow any responses to this post through RSS 2.0.You can leave a response or trackback from your own site. This looks exquisite! It’s always a treat to see your new creations, always refreshing and very inviting. This new recipe is a perfect reflection of that! Five stars. I like this pouding a lot… Me either I’m constantly running on people who HATE coconut… I don’t understand, it’s a nonsense fort me. Anyway, I will try this pouding! I’m not a fan of condensed milk (in fact, I dispise the stuff!) but coconut milk sounds fabulous! Here’s one case where the substitute is superior to the original ingredient! And I’m sure it gives the pudding a lovely, silky texture. 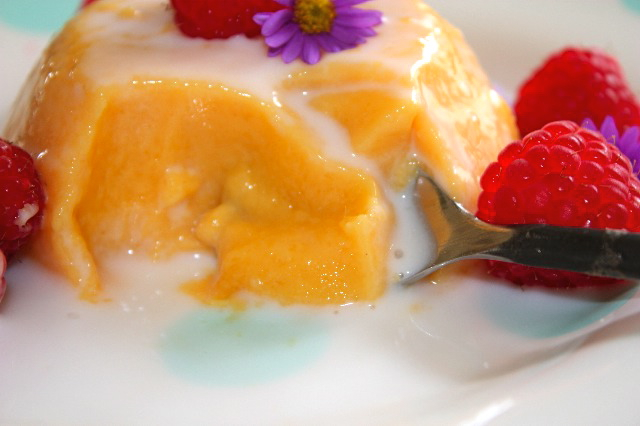 I love mangoes – I have managed to get some gorgeous Indian mangoes from the London market and will now try it in this pudding…looks amazing. Thanks for sharing. Silvia, I’ve missed out your post! This pudding sounds great. Hope you’re doing fine. Take care & thanks again for sharing. whoa, thanks so much for posting this! It is gonna be so helpful when I get Coconut Milk at the store! Crazy!